The couple tapped their lunch orders onto a touchscreen at the entrance to the restaurant at Disney World and were told to take any open seat. Moments later a food server appeared at their table with their sandwiches. “How did they know where we were sitting,” asked the guest.The answer, writes BusinessWeek(March 10-16, 2014), was on the electronic bands the couple wore on their wrists. That’s the magic of the MyMagic+, Walt Disney’s $1 billion experiment in crowd control, data collection, and wearable technology that could change the way people play—and spend–at Disney. If the system works, it could be copied not only by other theme parks but also by museums, zoos, airports, and malls. Change is always tricky for Disney, where introducing a new brand of coffee can spark a revolt by fans. And MyMagic+ promises far more radical change. It’s a sweeping reservation and ride planning system that allows for bookings months in advance on a website or smartphone app. 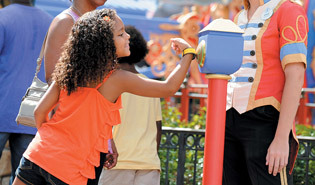 Bracelets called MagicBands, which link electronically to a database of visitor information, serve as admission tickets, hotel keys, and credit or debit cards; a tap against a sensor pays for food or trinkets. The bands have RFID chips—which critics derisively call spychips. The goal is to offer people what Disney calls “a more immersive, more seamless, and more personal experience”—allowing Disney employees to address a child by name, for example, or wish someone a happy birthday. Moreover, visitors with full Disney World schedules mapped out in advance on the MyMagic+ system will be less likely to jump spontaneously to one of the dozens of other attractions here in Central Florida, including Universal, SeaWorld, and Legoland. And, of course, the MagicBands make it so easy to spend. The new system also helped the Magic Kingdom park accommodate 3,000 additional daily guests during the Christmas holiday season by reducing congestion around the most popular attractions.